It's ironic that Columbus Day falls during Hispanic Heritage Month. Let's just say that it's not the Day Columbus discovered the Americas. It's the day that Columbus invented corporate America. He fine-tuned the policy of imposing the royal business agenda on an entire people, ignoring history and cultures that existed before he cast eyes on them, and sucking the resources from the Americas -- from gold to people -- practices that the worst American corporations have continued and run rampant with. Until now. On Columbus Day, pay close attention to Columbus, Ohio -- where the janitors union is poised to stop this pillaging of our time, energy, and work. We are smuggling notes to them about how janitors from Houston, Texas, won a historic victory over big corporations last year. Yeah, we're crossing borders-state borders. Of course, there are still some old tricks that the oppressors will resort to. More than 1,000 Columbus janitors are currently negotiating a new union contract in the hopes of bettering themselves and living the American Dream. Every day these workers clean property owned by some of America's largest corporations. And everything -- floors, windows, desks, kitchens, and toilets -- is spotless. The folks doing all this cleaning are largely African-American Somali, and Latino. The cleaners helped Fortune 1000 corporations headquartered in the Columbus area to profit over $5 billion last year. Just think of how mad people get when there are no paper towels to dry their hands off with. Imagine the outcry that would occur if bathrooms stayed filthy and office wastepaper baskets over flowed. We'd have mutinies across corporate offices, and business would suffer. On the other hand, some of these corporations even get subsidies from taxpayers. Nationwide Insurance, for example, has benefitted from more than $200 million in state and local subsidies alone, and much of this funding has come from Columbus taxpayers. Evidently, Nationwide is not on the janitors' or the taxpayers' side. The corporations employ the old ploy of contracting a third party to technically employ and exploit workers. Although the janitors don't work directly for corporations like Nationwide, they are specifically cleaning their bathrooms, their offices, their lounges. They are cleaning up their messes. These corporations have plenty of power and money to support good jobs for the workers who clean their offices. Are they? Apparently not. The cleaning contractors are demanding that workers have their hours -- and their health care -- cut. They're even using the lame excuse that "Obamacare made me do it," when companies have been trying to cut healthcare and working hours for decades. The cleaning companies' demands would hurt workers such as Esteban Rodríguez in Columbus. Rodríguez came to Columbus from Oaxaca, Mexico in 2006. When he started working as a janitor for national cleaning contractor ABM in 2007, he was paid just $7.25 an hour. He and his co-workers formed a union and have made some gains, but 7 years later, he's still only paid $10 an hour. Working six hours a day, that amounts to just $14,000 a year. And Rodríguez needs better -- not worse -- health care. A few months ago he was forced to go to the emergency room because he was urinating blood. He came out with a diagnosis -- they said it was stress -- and a medical bill for $4000. "I'm really struggling to pay that off," Rodríguez says. "My family depends on my income to support our household. If they cut hours, I don't know what will happen. It's hard enough to make ends meet each month with my current pay." Phony "Obamacare" claims aside, the cleaning companies can afford to offer good, full-time jobs. Just like they can afford over priced CEO salaries, golf tournaments, golden parachutes, etc. National cleaning contractor ABM also operates in Houston, where we are very familiar with Latino janitors' struggle for justice. ABM alone made more than $135 million in janitorial profits last year. But I guess $135 million in profits just wasn't enough. On September 30 ABM walked away from the negotiating table after demanding that nearly all the janitors work part-time. ABM is now joining the ranks of companies like Wal-Mart who are manipulating workers' hours so they don't have to provide quality healthcare to men and women who generate millions in profits. A lot of corporations are part-timing work. No wonder the economy is still a mess. As rich as ABM is, the clients who contract with ABM are even richer. Ultimately they're the ones who determine what sort of working conditions janitors and other service workers face. So where do they stand? You just need to watch a soccer game on TV or a soap opera on a Spanish language station to see that Columbus corporations such as Nationwide are after Latinos as customers. They want our money. Yet, they don't want to pay us. They want to take the $20 from our pocket, but they don't want to put any more money that we've earned through hard work in our pocket. That form of thinking has got to change. It's way off course. When Columbus invented America he was off course too. He wasn't in the country he thought he was in. Well, I have news for Nationwide and all other corporations like Nationwide. You aren't in the same country anymore either. You can't exploit workers. You can't crush unions. You can't think of people as just consumers. Tejanos are sending you a love letter in Spanglish with the magical words that will help our brothers and sisters in Columbus right the working world. We are speaking and strategizing across state lines, across disciplines. Here is this Librotraficante from Tejas expounding on the struggle of our union brothers and sisters in Columbus. Readers, let's celebrate our heritage. 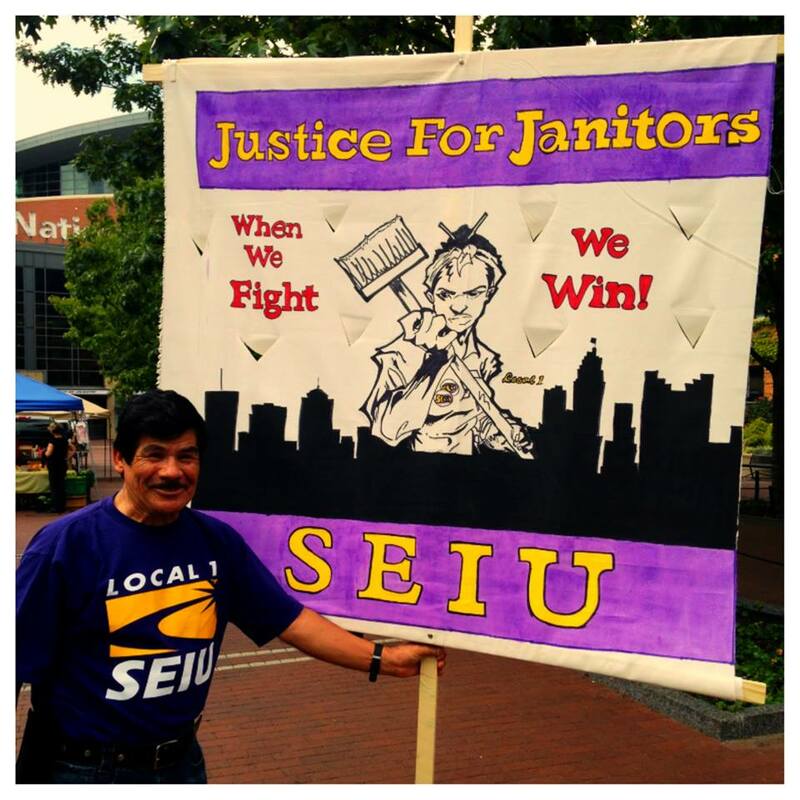 Let's support the Columbus janitors as they turn the world right side up -- making it a place of freedom and justice for all peoples. Now that's how we need to celebrate our Heritage.